LOW-CARB KIDS UPDATE: I’m so excited to announce my new Facebook pages – Low-Carb Lunch Club and my closed group – Low-Carb Lunch Box hacks. Come and join in the fun. I’ll see you there. Without a doubt, the number 1 question I get asked once people discover we eat low carb, wheat free and sugar-free – is what on earth do you put in your kid’s lunch boxes???? We have all grown up with the traditional sandwich, or more recently, wraps in our lunchbox. It is easy, just throw something half decent inside 2 slices of bread and voila – lunch. But is this really a good lunch? The wheat is 80% carbs, which means they will be hungry again in an hour, wheat causes leaky gut and malabsorption of vitamins. Modern wheat contains amylopectin and gluten. Bread and wraps are highly processed which removes any nutrition then fortified again. Basically, wheat is a rapidly absorbed carbohydrate with a high GI full of reactive proteins causing a leaky gut. Yes, children do have slightly different nutritional requirements from adults: they need more fat and protein. But filling their plates with empty calories in the form of white pasta, bread and rice is no nutritional kindness. Think of a really healthy sandwich, now take away the bread and what you are left with is the nutritious elements – meat, salad, cheese, mayonnaise etc. You will not be deficient in anything by giving up your wholegrain. Bread is a filler, a stodgy bulking agent to your lunch. But don’t we need whole grains for fibre and vitamin B’s? By increasing your vegetables, protein and good fats, you have more than overcompensated your fibre and vitamin intake. Modern day wheat actually causes a leaky gut (even though most of us are unaware) and malabsorption of vitamins. Wheat is bleached, bred to fight disease, bred to be resistant to viruses in the field. We have all been told to eat healthy, whole grains, and there is no disputing the science that when whole grain flour is substituted for white flour, there is a reduction in colon cancer, heart disease and diabetes. But by increasing your vegetable intake when eating LCHF, you far exceed any loss of fibre of Vitamin B group from not eating whole grain bread. My children would always bring home their crusts, or my daughter, would pick out the filling anyway and leave the bread intact to go straight in our bin – what a waste. Low Carb Kids 2 – printable guide to get your kids involved. How to plan you lunchbox each day. 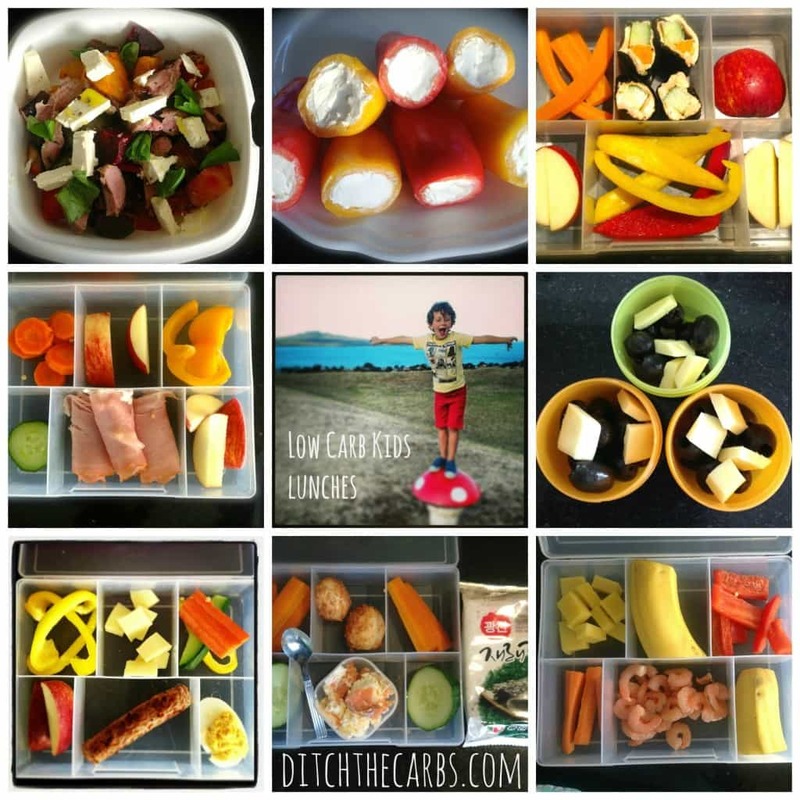 Low carb Kids 6 – an entire month of lunch box ideas. How To Start Kids Eating Whole Food? Begin by thinking what you would ordinarily be putting in a sandwich and give that. Children love picking at lots of different foods and grazing. Get a lunch box with little compartments. My youngest actually has a small fishing tackle box for his lunchbox. Or use little containers, silicon cupcake cases, bento boxes, etc. Start slowly. If you have a fussy eater, your household will not be a happy one if you go straight in and change everything overnight. Start by changing one aspect at a time. Maybe just remove the bread and give them their regular fillings, but keep everything else as it was. If they really can’t do without a sandwich, find the thinnest bread or thinnest wrap so they are exposed to less wheat, but eventually, the wheat must go. Make them oopsies or egg wraps. What about wheat free crackers? No more cakes, biscuits, muesli bars. Slowly cut down on the high-sugar fruit. Use cold meat as a ‘wrap’ and put a slice of ham or roast beef, with some cheese or vegetable inside. Roll them up and you’re done. Take a look at one of their ‘typical’ days lunchbox. Now if you removed the wheat, cakes, biscuits, muesli bars, flavoured yogurt – what is left? Not much? Think honestly about how nourishing their lunches are? How many vegetables are in it? How much GOOD fat do they eat? Fish? Bread, and anything made with flour and sugar, are purely stodgy bulking agents with no nutritional benefit. Some children are picky eaters so their parents try and get them to eat whatever they can when they can. These children, when you analyse their diet, are getting their energy through nutritionally devoid foods such as breads, flavoured yogurts, muesli bars, processed snacks. They snack continuously and then never eat their dinner – good old fashioned meat and veg. Don’t blame the child for having a poor diet, encourage them for trying new foods. I think it’s interesting when those picky children come here for playdates, yet they eat everything I offer. Many times, there is a power struggle at home and they know their mum will let them do it. They are always obliging with me, they might not like something, but they always try it out of politeness. Choose 1 or 2 of the following. Get your children to make their own list of things they enjoy and plan their own lunches. Ask your low carb kids to write down their favourite vegetables or fruits. Cut them in ways that make it easy to eat. Cucumber – sliced and used in place of crackers, or hollowed out and filled. Seaweed slices – you have to search out for a good brand of these in your Asian grocer. Many packets do not have the ingredients in English and many have way too many ingredients. These are a superb snack and full of iodine which many people lack for good thyroid function. Children love a little treat at school, and for afternoon tea. Hello, I’m here because I want my children to be healthy with me. I struggle with making everyone a different meals. My daughter is obese. She struggles to lose weight unlike my son that can just drop the weight. She is 8 and he is 10. She weighs 30 pounds more than him. She exercises, drinks water, but loves to snack and eat sweets. We don’t eat out maybe once or twice a week. We don’t have a lot of junk food at home. No cereals only rice krispies and cheerios. We only buy 1% milk and almond milk. The only thing I can see that is affecting her weight is bread, tortillas, spaghetti pasta, and occasion frozen chicken fingers. I found this website looking for low carb lunches for kids. I hope I am at the right spot. Starting my kids in low carb diet with me today. Wish me luck and pray for us. I need it very much. I want my daughter to be healthy. So I want to radically change how my kids and I eat. My oldest 6 doesn’t like any dairy or protein while my youngest lives on ALL protein, she doesn’t like starch, fruit or veg. If I give them a plate with carbs, and protein and veg, my son will eat all the starch and veg and my daughter only the protein. What suggestions do you have that can get us going in the right direction? Thanks and thank you for the awesome website. I’ve recently been given the challenge of cooking for a pescetarian girl (11yo) AND a 13yo growing boy who does not love fish (other than sushi). On top it, my daughter is a picky eater. Usual options of turkey wraps, cooked chicken, or chicken noodle soup are no longer available. She ends up eating lots of carbs (very little fruit) and only a little veggies. Both kids are slightly overweight for their height and, thanks to my genes, are likely in for a lifelong weight battle unless I help shift their palates. Sometimes I end up making two separate proteins for dinner. And Shrimp stir-fry is getting old. I could use some help with more ideas, particularly for my daughter. (While I’ve also offered canned tuna as well, she isn’t interested in it and is unwilling to taste). HELP! Is there a Gram/amount we should shoot for? I have had great success bringing in between 30 and 50 (I’m nursing my 1 yr old) I have an 8 year old girl, and I’m kinda lost if how much she should have. I don’t count carbs for my 3 children, they are active and within the normal weight range. Children are more carb sensitive than adults are, but each child will differ in their needs. Do they need to maintain strict blood sugar control? Do they have weight to lose? I never give specific goals because of this reason. Come and join my Low-Carb Lunch Box closed group where you can see what other parents pack of school lunches, and get some tips and tricks there. I also post my kids’ lunch boxes so you can see what I make them each day. I’ve started a low carb lifestyle about two weeks ago. For myself and my 3 children. So I am constantly searching for new recipes. Since school is starting up next week I was freaking out about what to pack in their lunch boxes. I came across your article and as I was reading started to laugh at the similarity of the ages of our 3 children. Mine are almost 7, already 10, and almost 13. My eldest loves to cook and always comes up with the weirdest combinations. The middle one is such a character and always has a comment about what is being served!!! The youngest is somewhat of a picky eater but never wanted to eat his bread before so he is loving this new carb free change. Thanks so much for the great ideas and tips. YAY, I love your comment. I’m so happy you have found it isn’t really that hard to make the change, do it slowly and let them have a hand in it. Baby steps and encourage them experimenting, it has got to be fun (for all of us 😉 ). No one wants tantrums, from them (or us). Any tips for toddlers? My 4 year old is delightful, but my 2 year old is a menace. I know he’ll eat cheese, yogurt, berries and cold cuts, but veggies, green veggies especially, are hard. My goal this summer is to cut out the processed foods all together and move them towards eating more LCHF as we do, this has two benefits, firstly helps my kids get and stay healthy and second, will hopefully help with the 2 year olds seizures. When we are on the low carb bandwagon (we’ve gotten a bit sidetracked) I make lettuce wraps. Just get a couple of big lettuce leaves, spread with mayo and add lunch meat! Portion control of fruit is important. Berries and melons are the best -and kiwi. Bananas are probably the worst fruit you can pack. But you are making steps in the right direction. I am just going to start transitioning my children this week- with school lunches. They have been off bread for several years but I’ve never eliminated everything else that needs to go. I’m super-nervous. My 9 year-old son loves junk. Wish me luck! Thanks for such a great website! Good luck! Go slowly and just improve as you go. Remember how far you have come. Well done and show them my recipe archives so they can choose to make something they really fancy. Hi Libby. I’ve been gluten/sugar free for a few months now and wanted my kids to follow suit. Lo and behold I find this gem of a website! Love all the lunch ideas in it. So simple and versatile. Keep up the awesome work!! Thank you Fatima and welcome. I am so glad you found my website and it is helping you and your children. I have another post coming up Low Carb Kids 8, so stay tuned. All my best tips and tricks. I’m just starting to make the transition now. My eldest (7 yo) is going to be the hardest to convert. I will take it slow and sub one thing at a time I think. The bread will be the hardest to ditch. Excellent. That’s exactly what I did. Slowly transition them to low carb and no bread. It is just as challenging for you as it is for them, but as time goes on it gets easier as you get into a routine of what to make them. I went from 1-2 loaves a week to only half a loaf and then making the decision to not buy any more and packing away my toaster and bread maker. Bread is such a convenience, but such a stodgy, zero nutritional one. You also save so much money by not buying bread, cakes, biscuits, crisp etc. Good luck and let me know how you get on. Take a look at my pinterest page for more wheat free lunches, low carb kids ideas. Libby.